1-mL BD Luer-Lok insulin syringe - available with either a detachable needle or a permanently attached needle - support many clinical uses and crucially prevent needle disengagement, medication leakage, and spray or tubing disconnect. We also offer a 1-mL insulin syringe with the BD Luer-Lok tip or the U-100 slip tip. Needle Length (in.) 1 in. Q. How are BD insulin syringes sterilized? A. Using cobalt irradiation. Sterilization is the last process before shipping. The insulin syringes are already packed in their poly bags and boxes. Q. Can BD insulin syringes be used for other types of medications? A. 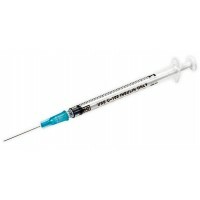 Your doctor or pharmacist should prescribe the proper type of syringe to be used for your medication. Q. Do insulin syringes expire? A. Yes, they have a five-year shelf life. They should always be stored in a temperate, dry area. Q. Can insulin syringes be pre-filled? A. BD does not recommend that any of our insulin syringes be pre-filled more than a few minutes before the injection. No studies have conclusively determined the safety or risks associated with this practice. Q. Can insulin syringes be reused? A. BD insulin syringes are designed for single use only, and are clearly labeled as such. Today's insulin needle is thinner and more delicate for greater comfort, so needle reuse can damage the tip and cause injury.